Eden loves Halloween and this year we decided to make her a Pippi Longstocking costume. She was really excited, but worried that most of her peers would not know who Pippi was. Unfortunately, this story book heroine is unknown by most children today. I absolutely loved Pippi Longstocking when I was a kid. In fact, I’d like to believe it was her fault that I spent so many hours of my childhood in time-out chairs or sitting in the hallway at school. (Believe me I was not always the “goodie two-shoes” you think I am.) Perhaps she didn’t make the best “role model”, but I loved the way she was able to outsmart adults. I was indeed quite a “prankster” (brat may be more accurate), but sadly, my parents and teachers didn’t find my behaviour all that amusing. I found this original trailer for the Pippi Longstocking movie and couldn’t help but think about how much times have changed. I look at Pippi’s pranks and antics and they really don’t seem that funny anymore. It reminds me of the times in which I’ve tried to share some of my favourite childhood family movies with my own kids only to have them complain and show no interest. It seems that kids are so accustomed to dynamic special effects and fast paced story lines, that the old movies don’t have nearly the impact they had when they were first released when I was a kid. It is a bit sad to think how spoiled we are by technology and how entertainment has become so complex. We have a cupboard full of board games that often go unused. I often ask the kids if they’d like to play (I LOVE board games) and most often they have no interest. I think of the hours of fun that we spent playing cards or board games and honestly can’t understand why my children aren’t interested. It seems like entertainment has to involve video making, cameras, computers, iPods or video games in order to pass the kid test these days. If you were a fellow Pippi fan, you might enjoy this trip down memory lane. 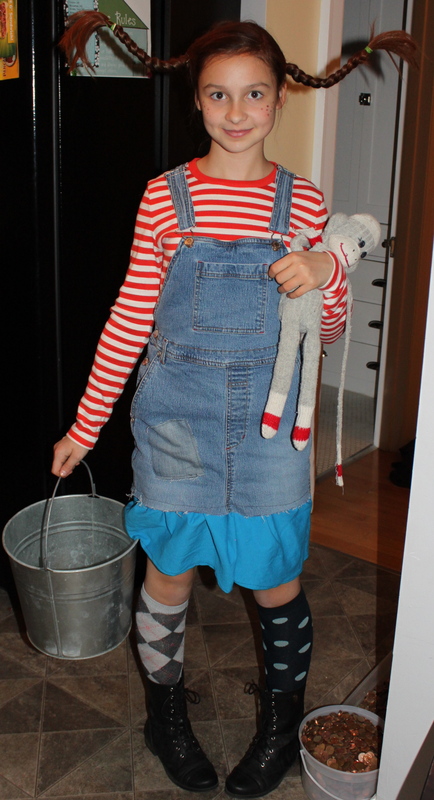 The great thing about a Pippi Longstocking costume is that it pretty much consists of regular clothes. The key is putting all fashion sense to the wind as she always had a collection of mismatched outfits. We decided to go for her classic look with a red and white striped top with a denim jumper. 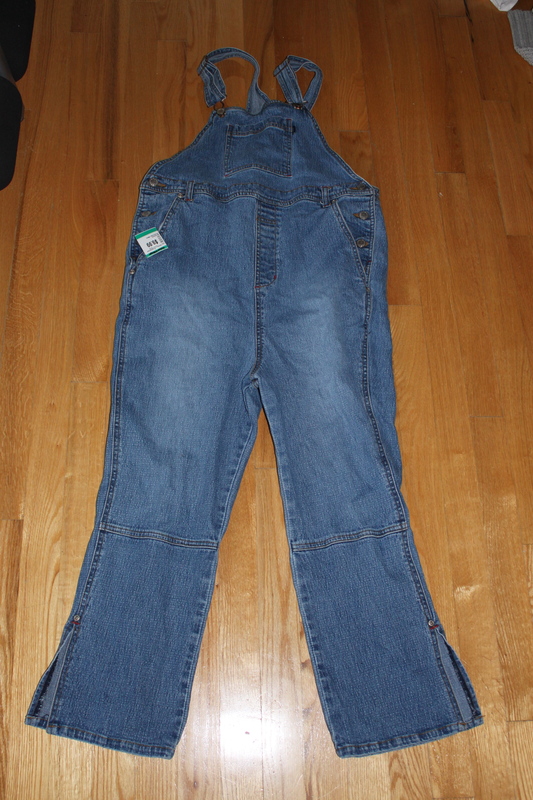 We found a t-shirt and a pair of denim overalls at the thrift store. I cut-off the “legs” of the overalls and converted it into an overall jumper dress. I also added a patch from my denim scrap collection. I cut up an old t-shirt and added a ruffle layer that extends below the bottom of the skirt to extend the length and give the dress more of a layered look. We decided to buy Eden a pair of fall lace-up fashion boots that she could use for the costume and wear throughout the fall. We found these at Target as well as some knee-high patterned socks that were on clearance for $1.50 per pair. The socks can also be worn after. We also bought some orange hairspray to finish the look. This costume cost us less than $16 (not including the new boots and socks that Eden will continue to wear after Halloween). We dumped the pennies out of the big metal pail that they were in and this will be what she’ll collect her candy in. She will also carry her sock monkey (that I made her last Halloween to go with her Sock Monkey Costume) in lieu of Pippi’s pet monkey, Mr. Nilsson. For her braids, we simply opened up a wire coat hanger, and rounded the center around the top of her head and left the ends sticking out the sides to be shaped after the braids were done. We trimmed the ends of the wire with tin snips and sprayed her hair once the braids were in. 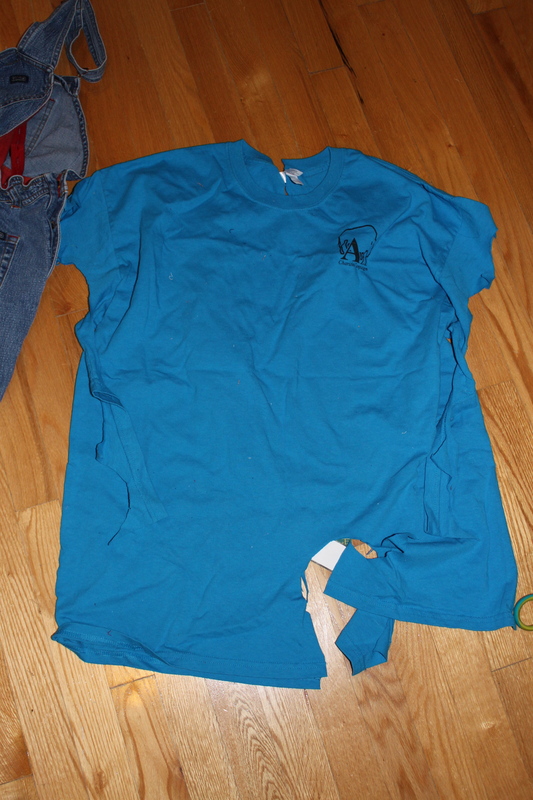 (I added a little blob of hot glue to the ends of the hanger so that they weren’t so sharp.) This costume required minimal sewing and was among the easier ones to pull together. Eden had a Girl Guide Halloween party on Monday, so I have a picture of her all dressed-up, pre-Halloween. Shay won’t have a final fitting until tomorrow, so we’ll have to share his costume then. For other costume ideas, check out my previous Halloween Post. You might enjoy the video of Shay as Sesame Street’s “The Count“, if you missed the original post. Posted on October 30, 2013 by Cindy Roy •	This entry was posted in Family and tagged costume ideas, Halloween costume ideas, Halloween costumes, homemade Halloween costumes, Pippi, Pippi Longstocking, Pippi Longstocking costume. Bookmark the permalink. ← Halloween Scrooge No More!